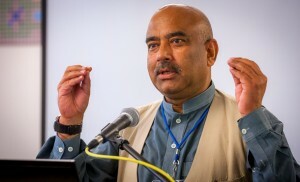 Explaining why Ali Gohar was selected for a major award, he “has proven himself to be devoted to the well-being of the people of his home country of Pakistan – and neighboring Afghanistan,” said J. Daryl Byler, executive director of the Center for Justice and Peacebuilding (CJP) at Eastern Mennonite University. “He has chosen to work in border regions and refugee settlement areas where violent conflict is the greatest and the suffering is the most pronounced. 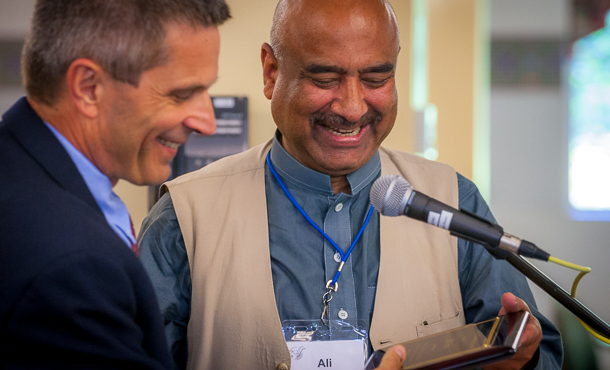 Byler presented a plaque marking the award – CJP’s first annual Alumni Award for Outstanding Service – to Gohar in a May 20, 2015 ceremony attended by about 170 people from two dozen countries, including 37 of the world’s leading experts on restorative justice. Gohar describes himself as the rehbar – the Urdu word for a guide or someone who shows the path – for Just Peace Initiatives, the organization he founded in 2003 in Islamabad, Pakistan. In brief remarks after receiving the award, Gohar spoke of the many people he knew and loved who had died due to violence in his country, sometimes due to the tradition of honor killing, but also due to politically motivated violence. He said he drew strength from God, the reconciliatory aspects of Pakistan’s indigenous and faith traditions, and “the knowledge I brought from here” in promoting peace in his native land. Gohar stressed that the world can and should learn from the positive aspects of Pakistan’s indigenous traditions, including that of village-level jirgas led by respected elders, where efforts are made to resolve conflicts peacefully through wide consultation. Gohar said he learned the term “trauma healing” at CJP, but realized that such healing is compatible with his own Pashtun ethnic and Islamic religious tradition. Gohar highlighted in his remarks the widespread collaboration of Just Peace Initiatives with Pakistan’s police to promote alternatives to imprisonment and lengthy, expensive court processes for wrong-doing and conflicts. He thanked Australian criminologist John Braithwaite for spending time in Pakistan in the spring of 2013 to research the impact of this work and to publish his positive findings. The world hears largely negative news reports about Pakistan, Gohar said, but it needs to know that Pakistan has positive lessons to offer, as Braithwaite found. Written TV scripts for nationally broadcast programs aimed at opposing drug use, preventing AIDS and reducing domestic violence. Produced books and manuals in both English and Pushto that offer instruction on the basics of conflict transformation, including A Little Handbook on Restorative Justice co-written with Howard Zehr. Encouraged the revival and improvement of Pakistan’s and Afghanistan’s traditional jirga system for resolving conflict — using a community process of consultation similar to restorative justice. Run a pilot project that explored diversion as a way of reforming the treatment of juvenile offenders. Encouraged improved ties between communities and their police forces, including women’s advisory groups to the police. Supervised provision of water and sanitary facilities to 50 primary schools. Served as a resource person to various UN agencies, including UN-women, UNHCR, UNDP, UNICEF, and UNESCO.